Bordeaux, our gorgeous new release has recently been awarded GOLD MEDAL and BEST FLORIBUNDA OF TRIAL at the 2017 National Rose Trial Garden awards held in October. 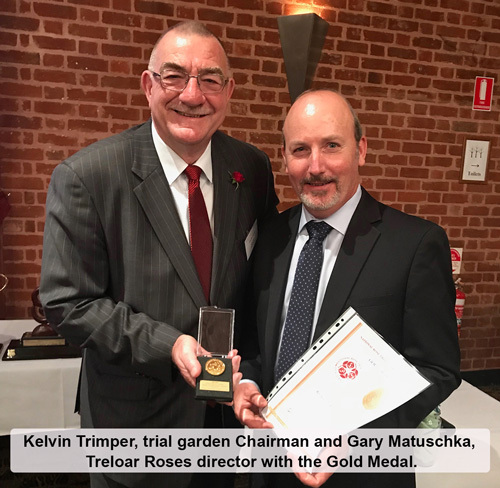 Treloar Roses director Gary Matuschka and his wife Rachael attended the awards dinner and were elated to receive a total of six awards from seven varieties entered. By the end of the night, they went home with a Gold Medal, two Silver Medals, two Bronze Medals, plus the Best Floribunda trophy. All varieties they entered were bred by Kordes Roses of Germany, world renown rose breeders who Treloar Roses are Australian agents for. 'The new varieties coming through from Kordes are so beautifully healthy and disease free, plus we are seeing a lot with fragrance now too, such as the recently released Parfuma collection' said Gary Matuschka, Treloar Roses director. 'The trial garden awards back up our own observations from trials here at the farm. There’s no doubt Australian gardeners will benefit from this new generation of healthy, easy to grow roses' he added. The National Rose Trial Garden of Australia is based in Adelaide, with rose trials conducted over a two year period. During this time, each variety is assessed fourteen times by a team of ten independent assessors drawn from all forms of gardening. The criteria for judging includes habit, health, flowering, pest & disease tolerance and fragrance. The scores are then converted to a percentage for the purpose of determining awards. Our released 2017 awards winners are listed below. 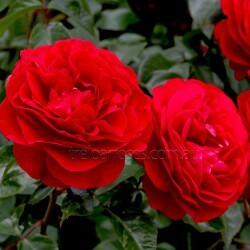 Potted roses are available for shipping now, on selected varieties. Click here to view our previous award winners. (Korelamba) - Great for mass planting or for a splash of colour. This wine red floribunda has an abu..
(Korumneza) - This stunning novelty rose will delight you with is charming array of semi double bloo..
(Kortrameilo) - This moderate sized climber produces large clusters of clear red blooms that have a ..
(Korhopiko) - Truly a gardener's friend. An abundance of eye-catching blooms in a stable colour of i..